Lexington Square fully supports summertime relaxation! We can all agree that summer is the perfect time to fire up the grill for a cookout with friends and family. Not only is grilling one of the best ways to bring out the flavor in food, it’s also a delicious way to cook healthy options including vegetables, seafood and lean meat. Whether you have a charcoal or gas grill at your home, check out these tips to make the most of your grilling experience! 6. Keep it clean. Proper cleanup is essential if you want to continue using your grill for years to come. To clean a gas grill, first turn it on high for 10 to 15 minutes with the lid closed. Turn it off and let it cool slightly before using a wire brush to loosen the residue. When the grill is completely cool, wipe down the inside and outside with a cloth and warm, soapy water. Rinse with clean water and wipe dry. To clean a charcoal grill, first make sure it’s completely cool. Remove the grates and the old ashes, either by emptying the ash catcher or using a garden trowel to scrape them out. 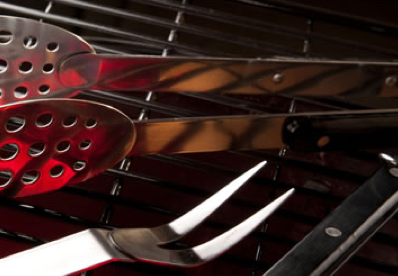 Clean the grill grates with an oven cleaner, wiping off the cleaner with paper towels after the grease is loosened. Use warm water and soap to wash the outside of the grill, and rinse with clean water afterward. 4. Add flavored smoke. Hickory, mesquite, oak and other types of wood chunks or chips can add some zest to the food you’re cooking. The woods aren’t used as a fuel source — they just bring in natural flavoring. Never use softwoods like pine, cedar or spruce, as they produce resins. 3. Use foil. It allows the flavors of the food to blend without anything dripping into the grill, and it keeps food extra moist. 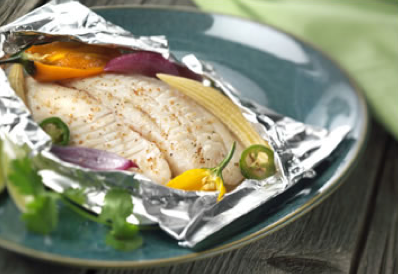 Take a piece of heavy-duty foil and create a packet for your food. Place the food in the center, leaving some space for heat movement and expansion. Foil is also great for grilling mushrooms, onions, peppers and other small vegetables. 2. Don’t forget the wooden skewers. They’re perfect for kabobs. 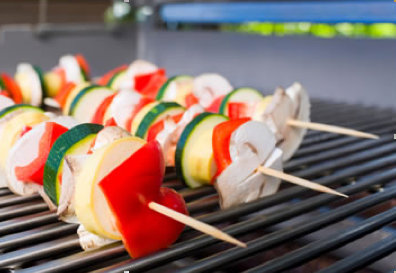 Soak the skewers in water for 20 to 30 minutes before putting the food on them — it will prevent them from charring when they’re on the grill. It’s always a good idea to separate the items that cook quickly from those that take longer to cook. For example, place fruits and veggies at the outer edges of the grill, and put the meat towards the center where the heat is strongest. 1. Get equipped. You’ll need tools to flip, test the temperature, clean and more. Get tongs, mitts, non-stick spray, a meat thermometer, spatula, fork, vegetable basket and basting brush. To keep things clean, make sure you have a wire brush and aluminum foil on hand. Nothing beats a good barbecue with the people who are closest to you in a home you love. Visit Lexington Square to see how you can get the most out of your summer get-togethers by having great friends, beautiful weather and a gorgeous home. For more information on Lexington Square, visit us here!